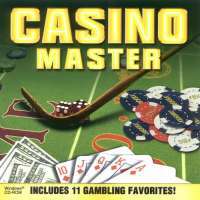 Welcome to the multimedia CD-Rom edition of Casino Master. You can learn and practice 9 exciting casino games at your own pace, without risk, then use the skills you develop to improve your chances of winning at a real casino. While playing, you can bring up on-line video and audio gambling instruction by noted professional gambler and gambling teacher John Patrick. John will guide you through the games and help you learn to be a winner. Although you can play all of the programs directly from the CD, you cannot save options or win/loss data. All games have video instruction, accessed through the Video menu. To call up a video clip any time while playing a game, all you need to do is select an item from the Video menu. Blackjack, Craps, and Pai Gow Poker also have audio instruction keyed to specific playing actions. The manuals for these games provide details.